January 29, 2012 Marcus Mottley, Ph.D. Emotional Freedom Therapy or (EFT) is a remarkable technique that alleviates emotional distress using simple yet elegant techniques based on the body’s energy meridians. There are very, very few techniques that ordinary people can use by themselves in order to gain some control over their dysfunctional feelings. EFT is one of those techniques. EFT (Emotional Freedom Techniques) is becoming known to many amazed users as a “modern miracle.” It can dramatically relieve emotional disturbances along with many physical symptoms. It often works in minutes, its results are usually long lasting, and side effects are almost always positive. While there are many books on Emotional Freedom Techniques, I recommend one book as a first read for those who seek the quick benefits of EFT. By teaching an easily adopted system of tapping on the body’s meridian points, the book Enjoy Emotional Freedom enables you to ‘tune’ and ‘tone’ your body’s energy system for immediate relaxation and relief from stress and anxiety. Enjoy Emotional Freedom enables and empowers the ordinary person to start getting results now, without having to be trained for years as a therapist. It’s full of useful tips and strategies which can be deceptively simple yet produce powerful results. 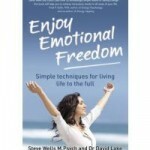 This book guides you into ways of being better balanced and more emotionally ‘fit’. Best of all, it gives you the life-long gift of being able to help yourself far more than you ever imagined.